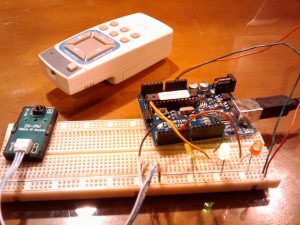 In the first article of the series, I explained how to break the code of a standard infrared remote control. In this article, we will use these results to control real world devices. 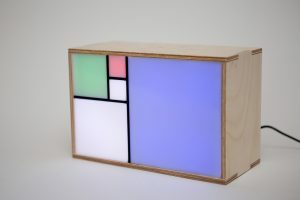 The so called “real world devices” are, at this point of the project, three LEDs. I’ll keep lamps and washing machines control for the next article about X-10 control. These values are used to build binary streams to reconstruct the 32 bit commands emitted by the remote control. Once the code values are known, we can add behavior in our micro controller. The command code is built using X-Or operations with the bits received from the remote. The power-on/power-off command of our remote control match the decimal number 279939191. When the button is pressed, the red LED is toggled on/off. The green LED is turned off during the time the Arduino is processing a command. If a new command is sent while the green LED is off, the program wont be able to catch it. Finally, the yellow led is flashes ON for 50 milliseconds every time a repeat command is received. 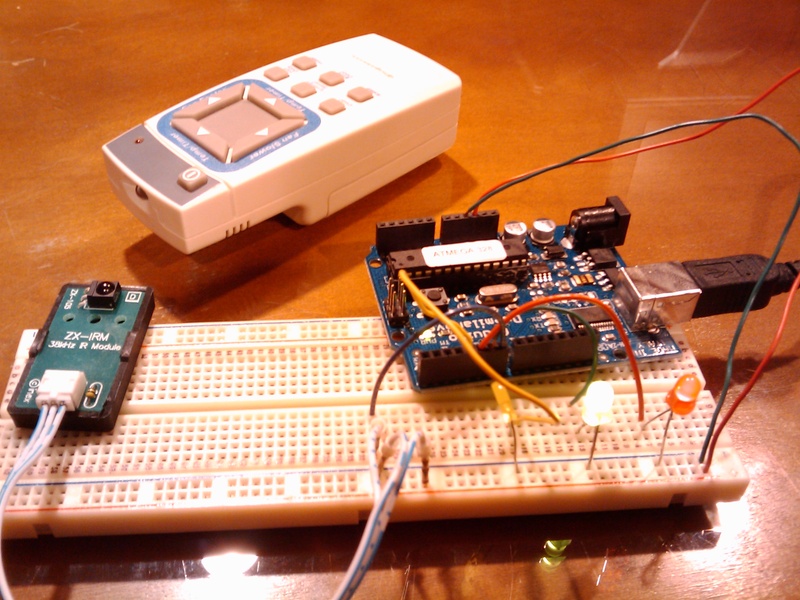 Using this code you can control about anything you want using an infrared remote control. In the next article we will control lamps through X-10 power line protocol. // Repetition command ... no bit pulses here. // Display the code received and number of bits or, repetitions.